Rebecca Cors is an assistant researcher at the Wisconsin Center for Education Research. Her projects focus on science and nature learning that happens outside of the classroom. She works primarily with science education programs and exhibits at UW-Madison’s Discovery Building, which are recognized as part of the Wisconsin Idea that links the UW with greater Wisconsin. 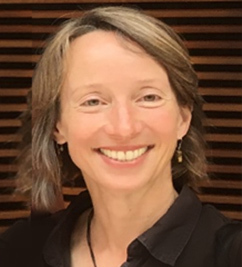 Her expertise in logic modelling, systems thinking, and collaborative data interpretation enable her to help managers examine the effectiveness of their programs in ways that are meaningful to them and to their stakeholders. Throughout her career Rebecca has worked to support natural resources management and environmental education efforts in the US, Switzerland, and China. She has published and presented research about out-of-school learning for science and nature education and about collaborations to promote natural resources management. Cors, R., Müller, A., Robin, N. (2018). Development of an instrument for measuring pupils’ familiarity with science education settings. Proceedings from the 2017 European Science Education Research Association conference. Dublin City University, Dublin, Ireland. August 21-25, 2017. Cors, R., Müller, A., Robin, N., Kunz, P. (2017). Toward a More Comprehensive Framework for Investigating Novelty at Out-of-School Learning Places for Science and Technology. Progress in Science Education. CERN Publishing, Geneva, Switzerland. Available online: goo.gl/4zFR53. Cors, R., & Nicolas, R. (October 2016). Evaluating informal science education: Identifying and measuring meaningful indicators of program effectiveness for a mobile laboratory program. Journal of Finnish Universities of Applied Sciences. (Special Issue: EAPRIL 2016). Available online: goo.gl/VQbGVq. Cors, R., Müller, A., Robin, N. (2015). Advancing Informal MINT Learning: Preparation and Novelty at a Mobile Laboratory. New Perspectives in Science Education, 53-58. Cors, R., Matsubae, K., Street, A. (2013). P is for process and parity: How MFAs, transdisciplinarity, complex adaptive systems thinking and education reform are keys to better managing phosphorus. In K. A. Wyant, J. R. Corman, and J. Elser (Eds. ), Phosphorus, Food, and Our Future. Oxford Press. Ulrich, A.E. & Cors, R. (2011). Global TraPs: An international effort to promote sustainable use of phosphorus. In: Ecoregion Perspectives. Sustainable Agriculture in the Baltic Sea Region in times of peak phosphorus and global change. Baltic 21 Series No. 4/2011.26-28. Cors, R. (2004). Improving U.S. State Agency Environmental Management through Organizational Learning, Action Research, and International Exchange. Gaylord Nelson Institute for Environmental Studies, Land Resources. Program Thesis, University of Wisconsin – Madison. Cors, R. (2003). What Is a Learning Organization? Reflections on the Literature and Practitioner Perspectives. EPD 699: Organizational Learning for Environmental Management. Engineering Professional Development Department, UW-Madison, Madison, WI. Cors, R., Courter, S., Eagan, P. (2003). Promoting Environmental Protection Through Collaborative, Learning-Based Approaches. American Society for Engineering Education Annual Conference Proceedings. Eagan, P., & Cors, R. (2003). An Organizational Change Strategy to Improve Environmental Protection. International Symposium on Electronics and the Environment in conjunction with the IEEE Electronics and Recycling. Summit Proceedings, Boston, MA. Cors, R. & Eagan, P. (Winter 2003). Industry and Ecology, a Partnership that Works. Wisconsin Academy Review, Madison, Wisconsin. “Mobile Laboratory Think Tank: Interpreting results of a study about optimizing a mobile science education laboratory,” Mobile Laboratory Conference, Columbus, Ohio, July 12-15, 2016. “Engaging under-represented groups in Global TraPs,” a research effort about sustainable phosphorus use led by ETH Zurich and the International Fertilizer Development Center. Zurich, Switzerland. August 2011. “Academic writing for non-native English speakers: sheer madness or a walk in the park?” A writing workshop for the Natural Social Science Interface group, ETH Zurich, Switzerland. March 2011. „Warum schützen meine Nachbarn die Umwelt nicht?“ (Why don’t my neighbors live sustainably? ), facilitated discussion about behavior change campaigns, Liechtenstein Verein Welt und Heimat, March 2010. “Focus Group Research Methods,” Guest Lecturer, Sociology Department, Western Washington University Sociology Department, Bellingham, Washington, U.S. Fall 2008, Winter 2009. “Encouraging Pro-Environmental Behaviors and Lifestyles,” Society for Human Ecology International Conference Session Coordinator: Community Based Social Marketing, Western Washington University, Bellingham, Washington, U.S. September 2008. “China and Global Population Issues,” Sociology Department, Western Washington University Sociology Department, Bellingham, Washington. Spring 2008. “Peace Corps Service in China,” Fairhaven College, Bellingham, Washington, U.S. Fall 2007. “The Great Turning,” Facilitated a public meeting discussion of this book by David Korten for the Bellingham Unitarian Fellowship, Green Sanctuary Program, Washington, U.S. Fall 2007. “Effective Technical Presentations,” University of Wisconsin-Madison, School of Engineering, Design and Analysis of Manufacturing Systems course. Spring 2003, Spring 2004. “A Conversation about Organizational Learning,” University of Wisconsin-Madison. Fall 2003. “Appreciative Inquiry: Building on Success Stories.” Facilitated an Appreciative Inquiry Session with Mary Buchel, for the American Society for Training and Development Exposition, Milwaukee, Wisconsin, U.S., 2003.